Learning to read Tarot for yourself can be a frustrating experience if you approach it wrong. However, if you have a truly open mind and want to expand your thought process or get to the heart of a matter; learning to do tarot for yourself can enrich your life in new ways. First things first; you need to have an honest understanding of your own motivations. Are you really looking for deeper insight? or are you merely wanting to hear what you want to hear? Are you asking to empower yourself or out of fear of loss or failure etc.? 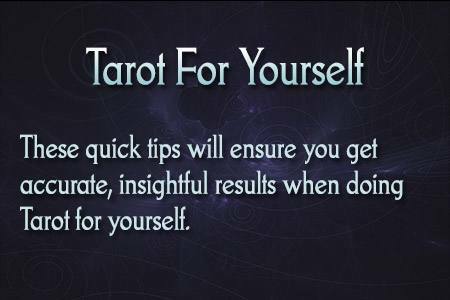 A quick way to discern your true motivations is evaluating your thoughts and feelings when you approach the Tarot. You aren’t taking time to take some deep breaths and detach from the emotion of the situation before drawing your cards. The current course of events is not going as you wanted and you are feeling resentful, hurt or distrustful. We all experience these things from time to time and it’s natural, but it’s not ideal for getting a true and accurate reading on a situation. If you are going to do a reading for yourself, always do it when you are in a relaxed frame of mind. Many people find that meditation first clears the mind of “racing thoughts” and anxiety. Physical exercise until you are tired is another great way to release stress and anxiety that may block your objectivity. When you are doing a reading for yourself, take a moment to take a few deep breaths and as you exhale, focus on releasing expectations (positive or negative) and focus on truth and insight. As a general rule I try to keep readings focused on the near future a few months to six months ideally, sometimes up to a year, but beyond that things can get really fuzzy. You’re very welcome 🙂 Glad you enjoy them and please feel free to share!